Do you have knowledge to share? a passion? to anyone who has a desire to share I recommend sharing your knowledge by starting a WordPress blog. Ever since I learned how to start a WordPress blog it has been extremely rewarding. If you’re looking to advance your career or just have fun by sharing your stories starting a blog is a fantastic way to do either. Sharing your knowledge online is a perfect way to show potential jobs and clients the value you can add to their company. There are many ways to create a blog online with options like Squarespace, Wix, Blogger and more it can be hard to choose. 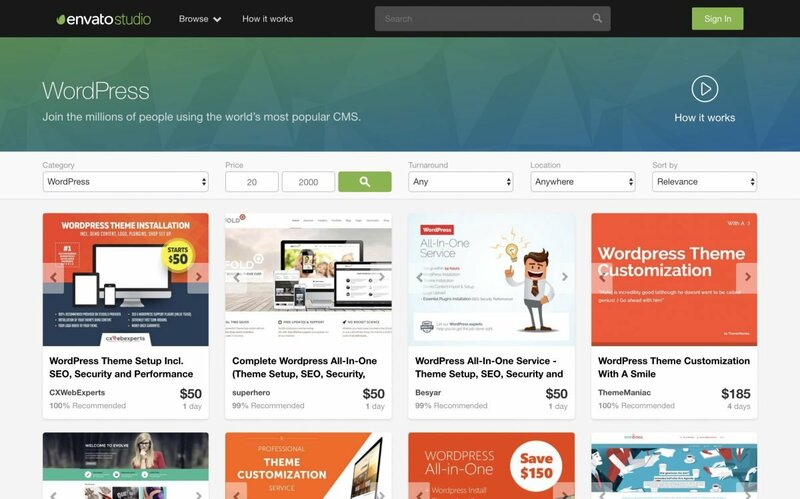 If you want ultimate control over your site a self-hosted WordPress site has become the most customizable to create a blog. But if you’re on this page you are already ready to build a WordPress blog. This step by step guide to starting your blog should only take about 20 minutes. 1 Why Blog with WordPress? There are many options available when creating a website or blog. Squarespace, Medium, Blogger, Wix, and hundreds of other options. Don’t get me wrong, these are great options if you don’t need much customization. Worst of all using a managed platform like Wix could lead to them going out of business and all of your hard work can be lost or difficult to migrate. With a self hosted WordPress blog you control all of your data and files, plus if you use a redundant WordPress backup of your site it’s nearly impossible to lose your content. Many people choose WordPress because of its ability for infinite customizability. WordPress is one of the best platforms that grows as you do. 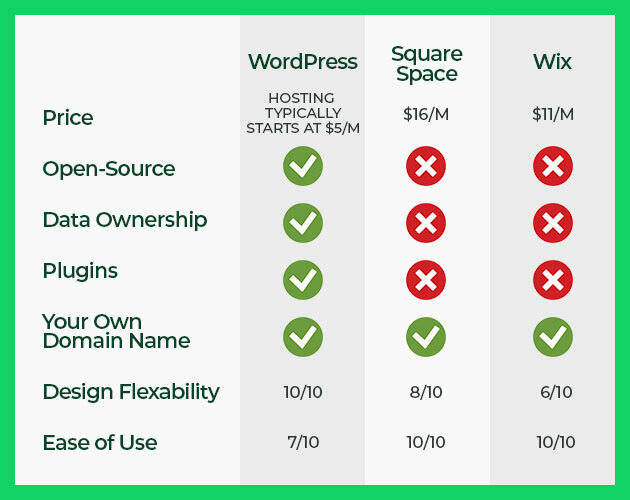 Managed platforms like Squarespace and Blogger have you locked into their functionality but a self hosted WordPress site can be extended with any functionality if you have access to a WordPress developer. Now you may be asking yourself why don’t I just use WordPress.com, WordPress.com acts differently than a WordPress site you host yourself (like with Bluehost). Self hosted WordPress uses WordPress.org code which is open source. Some of the benefits of WordPress.com are it’s easier to setup and designed for more of beginner experience. Which is great if you want a small simple blog and aren’t focusing a lot of time on a blog. Some of the downsides to using WordPress.com is that you’re locked to their theme selection, plugins, and limited on other features. While self hosted WordPress.org site will give you complete control over your site. This includes uploading any plugin you’d like, any theme, and modifying backend code to exactly tweak your site to your liking. Since WordPress powers 60% of the web you know it has incredible community support as well. With thousands of amazing plugins and tons of developers it’s easy to find a plugin or a developer to customize your site. 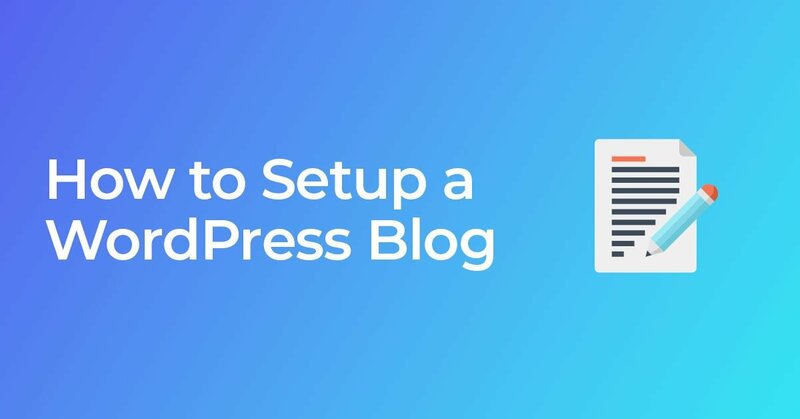 If you’re looking to make your blog as professional as possible; a self hosted WordPress blog is the way to go. If you’re unfamiliar with domain names, a domain name acts as address for your blog. For example google.com, facebook.com, etc are all domain names. Domains act as an address to point your computer to a server. If you’re using a free service like Wix and don’t buy a domain name you’ll have a domain like ‘mysite.wix.com’ which is never going to look professional. So getting a domain name is an essential part of any blog that wants to be taken seriously. When buying a domain name I recommend using Google Domains. You likely have an account. Well everyone has a Google account so you’ll never need to hunt down an obscure login. Plus it’s likely they already have your credit card info. Google Domains interface is super simple. Many web companies have very cumbersome interfaces for no reason. Google Domains takes away one of those stresses. Plus they aren’t constantly trying to sell you upsells. A benefit of buying your domain name separate from your host is the ability to move services later. If your website becomes a huge hit it’s easier to change hosting companies if you bought your domain separately. Now that you have an address for your blog you’ll need to point it to a web host. I don’t recommend buying your domain name from where you buy hosting. Which is why we used Google Domains above to get your domain name. There are a slew of hosting options but we will be using BlueHost. The primary reason to use BlueHost is that they specialize in WordPress. Plus their plans only start at $3.95 which makes it easy on the wallet starting out. Additionally they offer 24/7 support so if you have any questions you can call them. They also include a 30-day money-back guarantee so there is no downside to changing your mind. 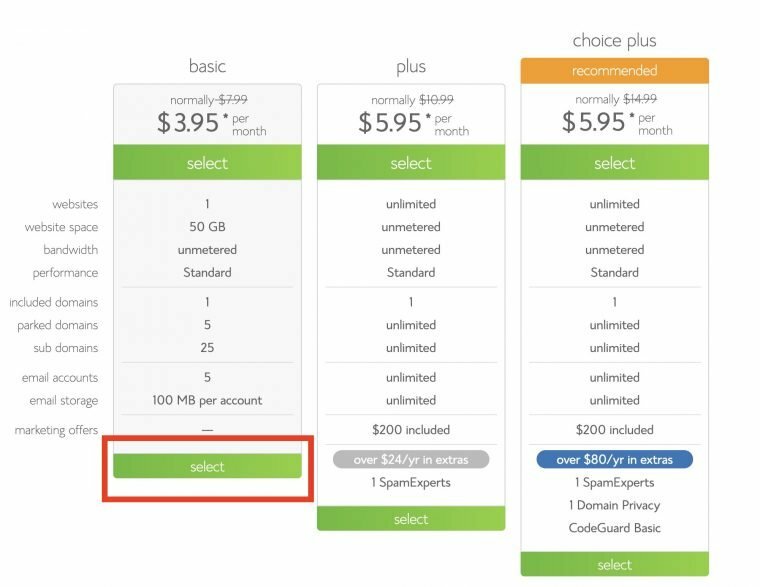 BlueHost’s basic plan includes 50gb of storage which is more than most sites will ever need. Unless you are going to upload thousands of photos stick to the basic plan. Worst case scenario you can easily upgrade your plan later. Since we already bought a domain name you can enter your domain name after selecting your plan. Installing WordPress on BlueHost is as simple as one click. After logging in you’ll see an option to add WordPress to your hosting. This will give you a fresh WordPress blog to start from. If you aren’t using BlueHost a lot of hosting providers will help you with the install, additionally if you’re a developer you can download the WordPress code base from WordPress.org. I highly recommend learning the basics of WordPress before selecting a theme. This will give you a greater idea of exactly what you need in . atheme instead of selecting one at the start and having to change it later. For most beginner purposes the default WordPress theme will fit your needs. After you’ve hit the limit of the default theme and want to customize your blog even more changing your WordPress theme is the best way. You can change the look & feel of your WordPress blog using themes. Whenever I build a website I typically use a theme from ThemeForest. Not all free themes are bad but many free themes on WordPress.org are limiting and often low quality. So picking a well supported premium theme is a must when building your blog. If you’re just starting out I recommend starting with OceanWP which is a fantastic free starter theme. If you pair this with Elementor you’ll be able to create incredible pages as well as have a stunning looking blog. Many themes will lock you into them because they add custom fields and other features that might be hard to migrate off of when you decide to switch. Most blogs contain key essential pages which users are used to seeing so it’s important to create them when you setup your site. This typically includes an about page (who are you) and a contact page (how do I contact you). It’s important to share who you are on your blog plus it’s a fast way to get writing experience. If you installed a page builder like Elementor (mentioned above) you can easily create a stunning about page. Especially if you have photos that walk the reader through each part of the story you’re trying to tell. First you want to decide if you want people contacting you, and if so why. For me personally I want clients to hire me to create their WordPress site. So I have a list of what services I can provide to a potential client along with a contact form. This is important to identify since you can tailor your contact page to that goal. 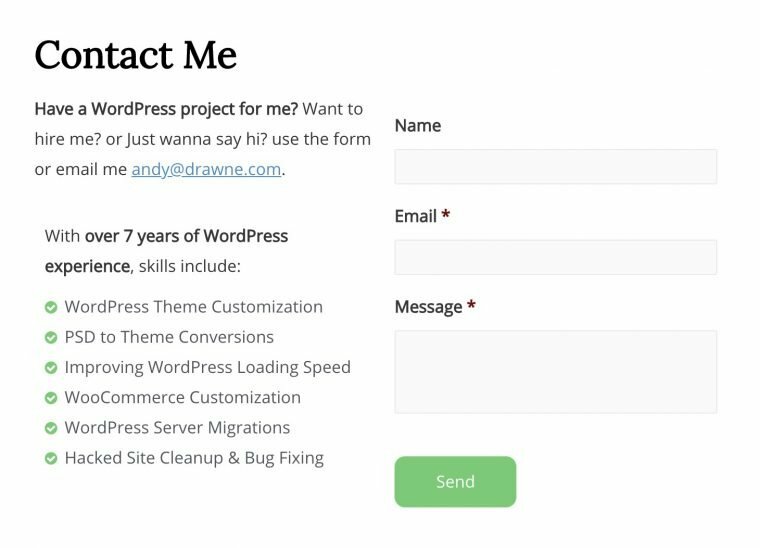 If you want a free contact form to embed into your contact page I recommend WPForms lite or Contact Form 7. To create more complex forms I recommend using Gravity Forms which will allow you to make payment pages, and much more. After you setup a WordPress blog one key role is WordPress plugins. The huge benefit to using WordPress is the massive selection of plugins. Installing WordPress plugins is as simple as going to Plugins > Add New. This interface will allow you to install plugins with ease. I recommend starting with some of the plugins below. Yoast SEO – Every WordPress blog I build I use Yoast SEO to change page titles and descriptions for SEO. SEO is a whole topic on its own but starting with Yoast will add some SEO features right away. Additionally Yoast will give you a sitemap to submit to Google Webmasters. Google Analytics by MonsterInsights – Use this plugin if you use Google Analytics to track visitors to your blog. Jetpack – Jetpack offers a slew of tweaks to WordPress like contact forms and the ability to add custom CSS. It’s worth installing Jetpack for its login protection. Also read my article of my recommended WordPress plugins if you want more suggestions. After you’ve tried out themes and plugins you’ve wanted you’ll want to customize more. If you’re a web developer there is tons of documentation on building themes and plugins. 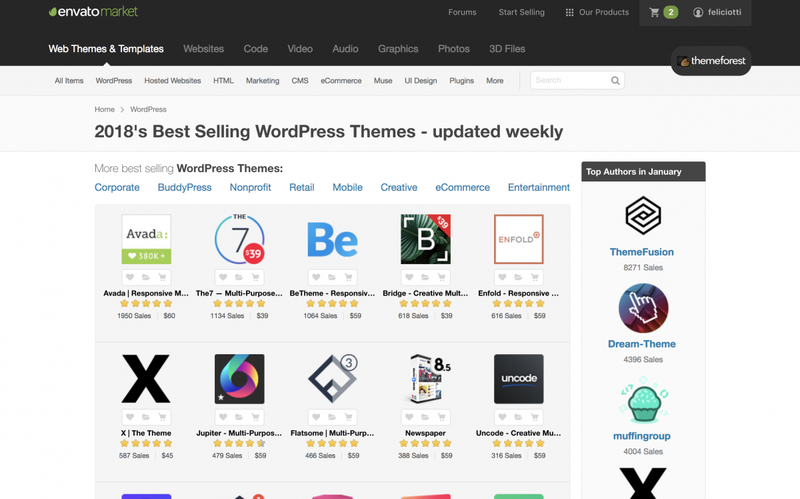 If you’re looking to hire a developer to customize your WordPress blog I recommend Envato Studio. Envato Studio is a simple way to hire a developer or designer to make modifications to your blog. Additionally if you’ve ever coded in PHP you’ll have an easy time transitioning your knowledge to WordPress. As a developer if you want to customize your site you can create a child theme of your current theme. A lot of themes will actually include child themes for you to start from as well. Once you get a child theme correctly setup you can modify functions.php to add modifications to your site. WordPress has tons of hooks and filters that allow a developer to modify the site without touching the original site’s code. This is why it’s important to create a child theme since a theme update will wipe out any modifications you’ve made on a theme. There are plenty of ways to make money while blogging, some popular examples are Amazon Affiliate, selling sponsored posts on the blog, running ads, or even selling an online course. Once your blog gets traffic and influence you’ll be able to monetize through multiple ways. It’s important to focus on quality content when starting out rather than monetization. Once you have created some content on your blog be sure to submit it to Google via Google Webmasters. This will tell Google to index your site so you can show up in search results.